New York City is world famous for its pizza featuring wide, thin slices, and huge pies that barely fit in delivery boxes. Some claim that the crust’s unique flavor comes from the city’s tap water that’s used to make the dough. 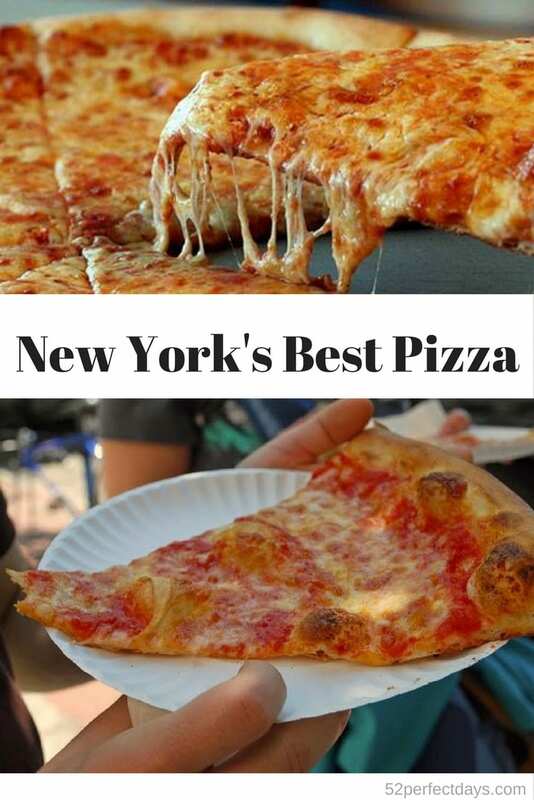 Whether or not that’s true, something makes New York’s pizza undisputedly delicious. Rather than name a single champion, we’ve profiled a selection of NYC’s best pizzerias. There’s something for everyone, whether you want a more upscale slice, crazy toppings, or just plain old mozzarella. Keep in mind- many pizzerias in New York serve whole pies, not single slices. This shouldn’t be an issue, as you’ll be going back for more! This famous SoHo eatery has lines stretching out the door on weekends, but its well worth the wait. Pizzas cooked in their coal fired ovens have the thin crust that New York Pizza is famous for, slightly blackened from baking, but still wonderfully chewy and yeasty. The mozzarella is fresh- great white pieces are placed on top of the pie, melting as it cooks. It makes for slightly uneven coverage, but the taste can’t be beat. Combine this with a wonderful sauce, fresh basil, and numerous toppings, and you’ve got a pie worth any wait. A note on toppings: classic pizza aficionados might go for plain cheese, which is a fantastic choice at Lombardi’s. However, with homemade meatballs (full size hunks of meat!) or thick and generous slices of sausage, it’s tempting to try something new. The thin crust of the pizza bends under the weight of any topping- this is the ideal slice to fold as you eat. 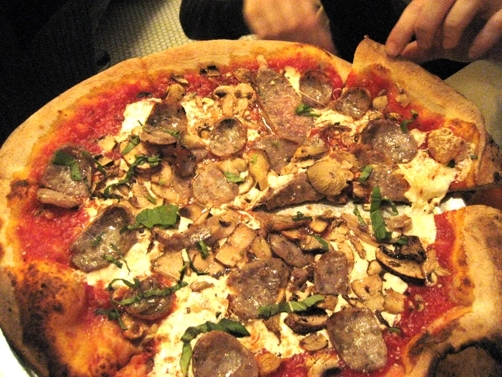 Established in 1929, John’s of Bleecker Street is a classic neighborhood pizzeria. Old wooden booths greet customers in this small dimly-lit storefront, and while it’s not nearly as fancy as other pizzerias, many New Yorkers claim John’s puts out the best pies in town. Service is prompt with no frills at this cash-only joint: with your pies you can order pitchers of soda or beer. Unlike Lombardi’s, which serves pies covered in chunks of melted cheese, John’s breaks the cheese into small bits for a more full coating. The sausage topping is another difference: no think slices here, instead, it’s little chunks all over the pie. With a terrifically thin and crisp crust, John’s puts out the type of pie that epitomizes New York. While not able to claim the title of oldest pizzeria in New York, John’s of Times Square may have the most unique location. The waitstaff was a little fuzzy on the details, but while John’s shares a namesake and at one point an owner with the location on Bleecker Street, that’s where the similarities end. Established in 1929, the pizzeria is housed in a space that used to be the Gospel Tabernacle Church. Upon entering, you’ll see huge murals and soaring ceilings. After a movie or show in Times Square, John’s is the perfect place to end a date- great pizza, but in a more upscale atmosphere than most. Like most pizzerias mentioned in this article, John’s of Time Square only does pizza by the pie, not the slice. In fact, “No Slices” has become their motto, stamped on each employee’s shirt. With pizza as great as theirs, a pie is definitely worth it, and with different sizes available, you can get a pizza for 2-3 people, or for larger groups. The crust here is wonderfully thin, crispy, and just a little charred from firing. A slightly sweet sauce hides beneath a full covering of mozzarella, and sometimes you’ll see small pools of delicious grease form on an especially fresh pie. No worries though- these aren’t the huge oceans of grease you see at certain street vendors or other pizzerias- this is just enough to remind you of what a decadent slice you’ve got. While at first glance the pies at Two Boots resemble New York’s traditional favorite, one bite will show you how different they are: Two Boots uses cornmeal to line the bottom of their crusts, creating a bit of crunch in each bite, much like Thomas’ English Muffins have farina. For many, this pizza is either “love it or leave it,” but for those who are fans, there is no comparison. Their unique crust combined with some truly original toppings creates the type of pizza some people only dream about. Two Boots offers toppings like artichokes, eggplant, spinach, both sweet and andouille sausage, creole chicken, BBQ shrimp, and of course, pepperoni. Feel free to create your own combinations, but Two Boots also offers up pies with their “standard” combinations, all named for movie characters or stars. For instance, “The Dude” (from the Big Lewbowski), is their Cajun bacon cheeseburger pie. What’s better than dinner and a movie? The Avenue A location of Two Boots in the East Village opened the Pioneer Theatre in 2000, showcasing independent and foreign films right alongside old screen gems. Theme nights include First Sundays Comedy Films and more. If you’d rather have a night in, this location also has a video store with free membership and an online directory of available titles. With rentals as low as $2.20 apiece, it’s a no-brainer. Order your favorite signature pie, and grab the corresponding flick for a fun night! If all you want is a single slice of New York’s best pizza, look no further than Famous Joe’s. While many of the best pizzerias only serve pies, Famous Joe’s offers up slices as well. A couple of chairs and counters are available inside, but the little store is often crowded. Located across from a small park in the West Village, this little pizzeria is great for a quick slice on the go. Joe’s is a natural choice for refueling while window-shopping the area’s boutiques and shops and it’ll run you only $2.50 a slice-perfect for a snack or lunch. Slices are served on a paper plate, and to-go orders are placed in a paper bag to keep the heat contained. With a thin crispy crust and just the right amount of cheese, Joe’s is a great fast way to take care of a craving. This article was originally written in 2008. What has changed in the New York pizza scene? What other pizza joints need to be added to this list? Pizza is a fun topic to research, isn’t it? We’ve tried the famous pizza at Ray’s in New York City which was fabulous but I’m going to say my favorite was in Italy….maybe because it was Italy? booked in the oven right in front of us…such a fun – and delicious experience. A great post! We loved Famous Joe’s pizza slices – so great and you could order a variety of toppings! We ate at John’s of Times Square too and we loved the decor and how beautiful it all was! I haven’t eaten NYC pizza on my last few trips there because I was busy checking out Korea town and some street food. But all of these sound amazing & it’s making me so hungry…wondering when I can go back! Great, comprehensive list. Pizza with meatballs sound great. In fact, all of it sounds great!